Carmen is very knowledgeable. This was a wonderful way to be sure we were seeing a few places we probably have not found on our own and be sure we were choosing traditional Salamancan foods. Carmen’s knowledge of history was wonderful. We would have liked a bit more tour of the old buildings within the area, although what we learned about the cathedral and university were wonderful. Carmen was a joy to meet and tour Salamanca with. Her knowledge of Salamanca and recommendations for the rest of our trip were invaluable . Carmen put us at ease very quickly and made the trip an exciting and enjoyable night out, thoroughly recommended. Carmen is delightful and very knowledgeable of Salamanca and specific details of Spanish history. We had communicated by email some requests to visit particular places and she was able to cover these in our walking tour. ¡Muchas gracias , Carmen! Carmen was absolutely fabulous! She is extremely knowledgeable and told us so many interesting stories. She was also fantastic with our 11-year-old son. She quickly figured out what he would like and kept him entertained. I highly recommend her. 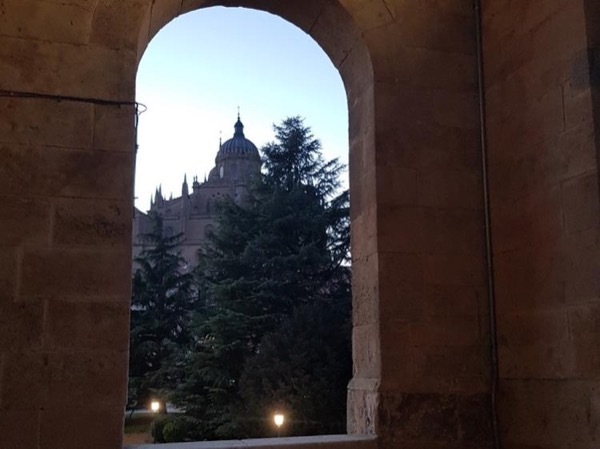 I planned this tour for shortly after I arrived in Salamanca, and it was really the perfect introduction to that great city. I learned about the history of this place and got all of the information I needed to decide how to spend the next day there on my own as I enjoyed some seriously good tapas. Touring with Carmen really helped me make the most of my time in Salamanca. Carmen was a very good tour guide. I did feel a little rushed at times. TOUR GUIDE RESPONSE: Dear Mr Moore First of all, thank you very much for your nice words about my job. And I am very sorry if you didn´t understand me. Those “graffities” which I showed you, were made by the students, as I told you, they are from XIIIc. until XVIII c. A lot of time before Franco ¡¡¡ During Franco time, they copied them and used them as a fascistic symbol. With the time these paintings were taking off from the walls. Very informative and interesting tour! Carmen knows a great deal about history and conveys the information with enthusiasm and pride in her city. Carmen is passionate about Salamanca her city and imparts so much information without being too serious or heavy. She paced our tour to suit us and we saw and learned so much about the city and Spain too. If you are looking to learn a little about history, religion, politics and the Spanish outlook and lifestyle then this tour is for you and it will not disappoint. Thank you Carmen for a great insight into Salamanca - I can't recommend you too highly. Carmen is very pleasant and knowledgable. We had a very nice time together. Thank you! Carmen was excellent. A native of Salamanca, she knew her town like the back of her hand. I thoroughly enjoyed all the tapas hideouts, especially the horse stables. She also spoke to me in Spanish and was patient with my earnest attempts to learn the language. Although I was tired from my flight, I had an enjoyable evening! Wonderful tour of the beautiful city of Salamanca! Carmen managed to bring the history and culture of the city alive with her insightful and interesting facts. So much to see, so little time, therefore, we will be visiting again very soon, hopefully with Carmen as our guide. TOUR GUIDE RESPONSE: I am very sorry that was your impresion about the tour. Carmen is very knowledgable and articulate. I learnt a lot about the culture and history of the region and of course about the university . TOUR GUIDE RESPONSE: Thank you very much Peter. It was very nice to show my city. An outstanding couple of hours was spent with Carmen, exploring the stunning city of Salamanca. We found her knowledgeable and with a warm sense of humour; highly recommended! Carmen is highly informed about history of Salamanca. She customized the tour to make it interesting for our two children. Overall, having Carmen as our tour guide in Salamanca has greatly enhanced our understanding of the city and its rich history. Carmen was very knowledgeable and professional. An excellent guide who spoke English well and has a passion for Salamanca. Carmen's love for her home town makes this tour unique. She explains the culture and history of Salamanca with humor, passion, and intelligence. Carmen did an excellent job introducing us to Salamanca in a very compressed time (day-trip from Madrid). She was further challenged by our arrival late in the morning because things close in Salamanca during the afternoon for siesta. She knows the city well and was able to address all of our questions. She provided good recommendations for the remainder of our day after she had to leave.